Image caption Sharon Perrett's family said she had a "beaming smile"
A church is holding an event to remember a woman who died at a house in Christchurch. Sharon Perrett, 37, was found with fatal injuries at Park Gardens early on 26 August. Daniel O'Malley-Keyes, 38, has been charged with her murder. Highcross Church in Amethyst Road will open on Sunday from 15:00 to 17:00 BST for people to light a candle and reflect and to sign a condolence book. Ms Perrett's family thanked friends and police for their support. A tribute released through Dorset Police said: "She'd light up the room with her beaming smile and outgoing personality." The church event will not be a formal service but vicar the Rev Paul O'Connor will be present for anyone who wishes to speak to him. 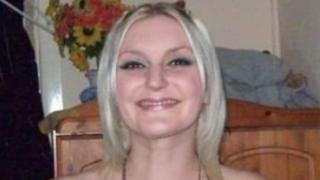 Post-mortem tests found Ms Perrett died as a result of blunt force trauma. Mr O'Malley-Keyes is due before Winchester Crown Court on 27 September.